Did you ever play connect the dots as a kid? Until you learned about and understood the process of drawing the lines from dot to dot, that page of dots really had no meaning, no clear purpose. It was simply a bunch of dots. It was only after you learned to connect the dots, and began to connect — dot to dot to dot, that the purpose of the dots, the meaning of the dots, began to appear. And with each new line you drew, each new dot you connected, the picture, the sole purpose for each of those dots — and all of the dots together, began to make sense. Each of those dots alone could exist only as a dot, but then the magic would happen. With the intentional and methodical connecting of all of the dots together, with each new line, their most important purpose, their true meaning became more and more clear. Until, finally, with excitement and wonder, you no longer saw a page of disconnected dots but a lovely, purposeful image. As far could tell, I was doing everything in life the way it was supposed to be done. I was ticking away at the timeline of life — High school, College, Corporate Job, Big City. Check, check, check, check. I had a great job with great pay, great benefits and great co-workers, a nice place to live, a large circle of close friends, and I had started exploring the world of travel. If you’re talking dots, those are some pretty good dots, and they made for a pretty good life. The only problem with my dots was that, no matter how great they were, they were all just kind of floating around on their own. There was nothing connecting them, no line from dot to dot that turned them from a disconnected set of dots into a connected, meaningful and fulfilling life for me. For a 20-something, I had it all, so to speak. And sure, I was happy (enough,) and thankful — even grateful, but under the surface, I was quietly unsettled and somehow still unseemingly incomplete. I tried and tried to connect the dots in a way that would create meaning for me, REAL meaning of a life that mattered. Then, it became clear to me. These were not my dots. See that image above. That is what life looks like (and feels like) when you have all the dots, but they’re not yet connected. Imagine removing the numbers and then trying to figure out how to connect the dots in a meaningful way. This is what it feels like when you are trying to create a life out of dots that aren’t made for you. These dots simply cannot be connected. If you find your dots impossible to connect, then please, please rexamine where you’re headed and make sure you are creating a life — full of connectable dots — that will bring special meaning and joy intended just for you. And if you like your dots — if your dots make you feel safe or maybe like you’re on the right track, then having them disconnected will suffice for a while, but eventually, if you want a life that matters, a life that has meaning for you on your terms, YOU’RE GOING TO HAVE TO CONNECT THE DOTS. Are they the right dots for you or possibly the dots you decided somewhere along the way you were supposed to go after or strive for? Will your current dots result in a life where you thrive or where you simply survive? What is the line of commonality, the line of purpose that runs through your dots to give them meaning? This is a topic near and dear to my heart, and I’d LOVE to hear what you think and where you are in connecting your own dots. And if you like what you’re reading here, please feel free to Like, Tweet and share in as many ways as you’d like! Connecting the dots will create more fun and freedom in your life. 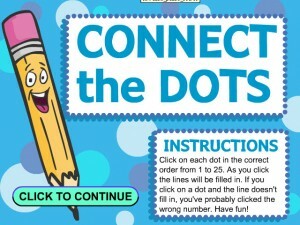 Play Connect the Dots now!